Manchester, NH - Chris Christie Is Doing Well In NH. Will That Be Enough? Manchester, NH - Chris Christie is fresh off his 50th day of campaigning in New Hampshire, a state where the New Jersey governor has recently won critical endorsements and his campaign is showing signs of life in the GOP race for president. But Christie’s laser focus on the first primary state means he’s spent little time building a presence in South Carolina and beyond that could turn a potential victory in New Hampshire’s Feb. 9 primary into national momentum. In South Carolina, which holds its primary Feb. 20, Christie has no office open and a minimal grassroots network. He’s spent little time campaigning there or in other Southern states that will hold primaries soon after. The question is whether that matters in a primary season that has been nationalized, particularly with the emergence of outsiders like Donald Trump and Ben Carson. Christie has taken advantage of that dynamic in recent weeks after the Paris attacks brought national security to the forefront, giving him the chance to employ his tough-talking persona and highlight his work as a federal prosecutor after the attacks of Sept. 11, 2001. Mike DuHaime, a senior adviser for Christie’s campaign, said that while Christie’s efforts may not be as visible as others, the campaign is working methodically behind the scenes to lay the groundwork in later voting states. Christie’s campaign has a consultant working in South Carolina, but campaign staffers won’t give the person’s name. DuHaime said the campaign has already qualified to appear on the ballot in 15 states and expects to be on the ballot in 22 by the end of the month — efforts that often require collecting thousands of signatures. He said the team has dozens of volunteers on the ground in states including Illinois, Alaska, Virginia, Alabama, Ohio, Vermont and Tennessee. Christie’s rivals aren’t waiting: Jeb Bush dispatched one of his Tallahassee-based consultants to South Carolina full-time and Marco Rubio has opened offices there. Ted Cruz tapped a local conservative party organizer to lead his ground campaign in the state, and he has the backing of Dan Tripp, who previously served as state director for Scott Walker’s now-defunct campaign. Christie’s most high-profile advocate is Columbia attorney Leighton Lord, one of the governor’s college friends who has hosted Christie fundraisers. Lord describes Christie as having a “light ground game” in South Carolina. And many in South Carolina, Felkel included, downplay the notion that Christie — or anyone else vying for the party’s more conventional, establishment branch — would have trouble building on a win or strong and performance in New Hampshire. Christie is counting on it. 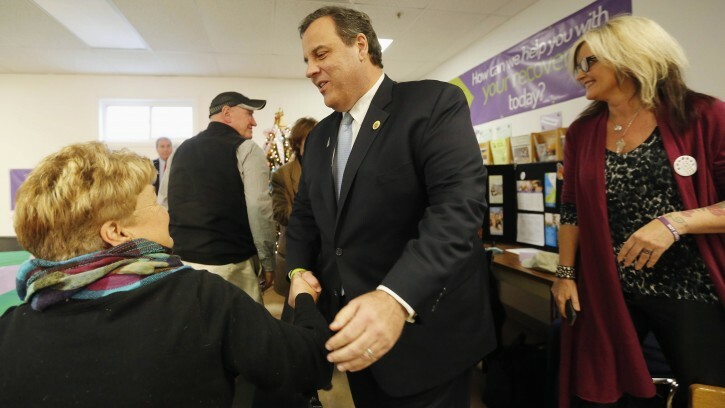 Christie has visited New Hampshire more than any other candidate and hosted 36 town hall meetings. It’s beginning to pay dividends: The conservative editorial board of the Union Leader, New Hampshire’s largest newspaper, endorsed Christie earlier this week. His campaign also recently announced support from Dan and Renee Plummer, well-known Republicans on New Hampshire’s Seacoast, and Donna Sytek, a former New Hampshire House speaker who had multiple candidates fighting for her support. The campaign’s long-term view hinges on their belief that the calendar becomes more favorable to Christie as time goes on, with many large and winner-take-all or Northeastern states like Illinois, California, Virginia, Massachusetts, Maryland and Pennsylvania, where they expect Christie to do well. “If you can build something well, it’s more likely to last, and this has been a very carefully, methodically constructed campaign,” Wayne MacDonald, Christie’s New Hampshire chairman, said.